#TheLivingCity is an open invitation to every concerned Malaysian citizen to participate in a discussion of an ‘ideal’ city. 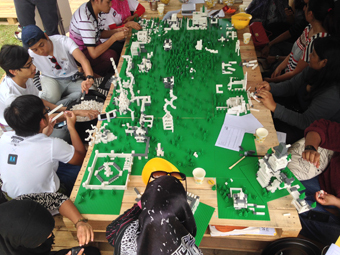 Malaysians often feel excluded from the process of the making of the cities they inhabit. This disconnect at times is reflected by underutilized public spaces, elevated roads that sections across well-established communities and degenerating livability of our cities. In our experiment at #TheLivingCity, we transfer the power of politicians and big developers completely to the people. 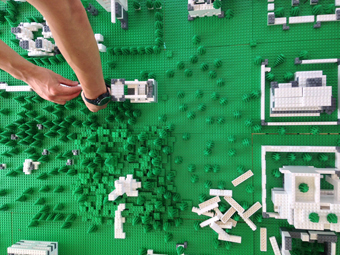 Everyone is invited to contribute a building/facility onto the green terrain using Lego as the only construction material. Originally, a virgin forest blankets the entire green terrain. 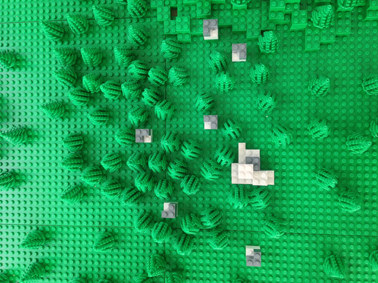 Deforestation occurs to accommodate the newly built buildings until an entire Lego metropolis is formed. Over the three days of the festival, we were able to observe an intense non-verbal negotiation process between our participants on what an ideal city should look like. The conclusion of the project saw a city that has undergone many rounds of evolution to arrive at a temporary equilibrium to satisfy the sometimes opposing needs of different groups of people. 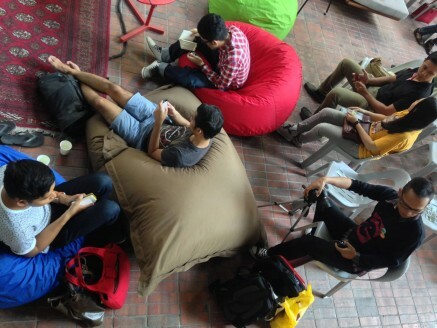 While FBP2014 has ended, the evolution of #TheLivingCity is in no way complete. Via this three days experiment, a lot can be learnt about the way our cities work when power is restored to its people to decide the fate of the places they live in. When the game first started, our earlier participants set out to build an elevated rail network. Soon after, an interesting pattern emerged in which most people added their buildings in the vicinity of the train tracks. The rail network was further extended to cover the entire geography of the still nascent city. It was interesting to note that no roads were constructed throughout the entire gameplay. Skywalks were also introduced soon after as people sought to connect different skyscrapers to provide mobility within the city for travellers on foot. While the government channels a lot of public funds for the constructions of roads, it seems like the people much prefer they spruce up existing public transport facilities and provide alternative forms of transport with low carbon footprint. The usage of Lego for construction is a great lesson on the recyclability of many construction materials. Old buildings that have outlived its purpose can be torn down and the materials reused in new constructions. 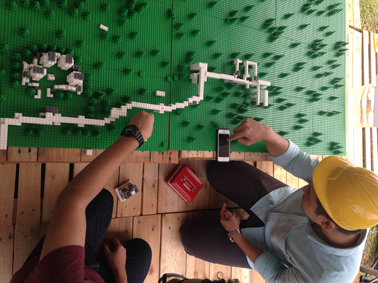 With Lego, our participants can easily reuse existing materials to pursue new forms. A lot of trees that were deforested were replanted on rooftop gardens, hence reconnecting people with nature and rebutting the notion that urban and the natural environment cannot coexist together. If big developers and centralized government have less involvement in the growth of our cities, it seems that Malaysian cities look very different from its present state. Participants of our game ultimately realize that each individual is part of a larger group of people to whom the city belongs to. The construction of a city of this scale cannot be achieved alone. And while we hope that our creation is spared from the endless cycle of demolition and construction in a city, we are ultimately powerless to stop others from replacing our buildings. This selfless compromise ensures that a city belongs to everyone instead of being subjected to tyrannies of powerful individuals concerned only with the immortality of their creation. At the end of the three days, all team members participate in the bulldozing of the city as we pack up, which was similar to the scale of destruction inflicted upon great cities by Mother Nature. The mass destruction is symbolic of the futile attempts of man to resist nature’s ways and it parallels the havoc wreaked on NYC by hurricane Sandy and on coastal cities of Philippines by Typhoon Haiyan. #TheLivingCity does not die in the hands of a government resistant to the idea of change, it dies because natural disasters are unstoppable forces with our current state of technology. Lay Sheng is an architect to be from KL. He understands the benefits of scale in cities and would like to see most cars removed from KL roads. He is an urban explorer who traipses around KL on the weekends to reconnect with his Malaysian roots as a newly minted critical thinking adult. He currently interns at #BetterCities. 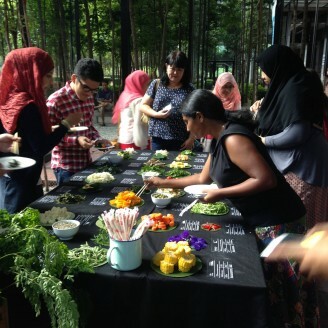 The sixth instalment of #BetterCities Talk series titled “The Edible City – Urban Gardening and food futures of KL” was held over the weekend at Menara Bata, PJ Trade Centre. 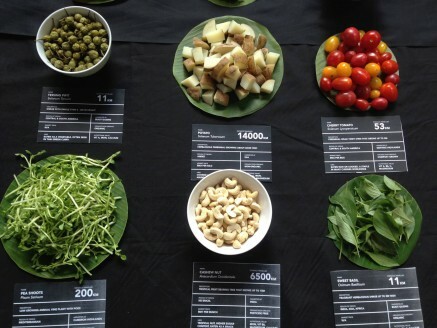 The talk featured a panel discussion with 4 invited speakers and was preceded by a culinary activity inspired by The Public Kitchen (http://www.stiftungfreizeit.com/2012/11/la-cucina-pubblica.html) to raise awareness about where our food comes from. A relatively high turnout left the venue comfortably filled. Attendees started trickling in at around 4 and for the next hour were invited them to to sample from a spread of some 40 varieties of vegetables sourced from local farms, home gardens and supermarkets. At around 5 pm, the panel discussion commenced with each speaker giving a 5 minute presentation about their respective projects. Kicking off the talk was Nova Ceceliana Nelson of Cultivate Central, who gave a presentation of the shared urban spaces she helped create in Singapore for the purpose of food growing. Nisha Firdaus Mohammad Faizal of Ecocentric Transitions then spoke about her work in environmental education and how sustainability is basically going back to the basics. Next up was Joann Lim of Green Sentral, self proclaimed accidental gardener, who recounted her personal journey of growing food and retold how she started container gardening on her balcony, which led to her spearheading a community food growing project at her condominium. She also posed a challenge to the audience to try to reduce their waste and to be aware of where it comes from. 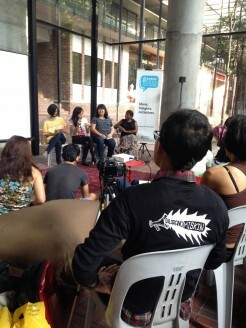 Finally, we heard from Ili Farhana Norhayat of Gang Chaos, a family of food growers. She retold how her foray into food growing was borne partly out of necessity and has since seen it as a way to reconnect not just with nature but also with people. She advised that “The most challenging thing about a community garden is building trust in a community. Like gardening, it’s all about commitment.” She also emphasized the necessity of sharing and creating a culture of sharing was the foundation of community. 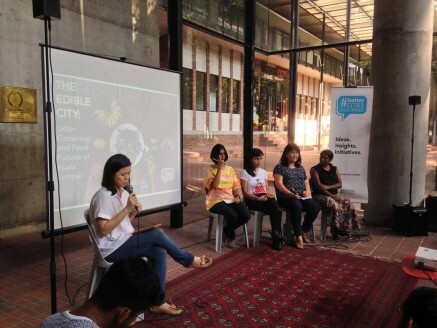 Following quick introductions from each speaker, panelists were then asked some pointed questions about food productivity and security by the moderator, #BetterCities intern Jia-Ling Loo. Her first question dealt with productivty with the question how much food one can really produce and was it enough to guarantee food security. All the panelists seem to think that it is not possible to achieve food security through urban gardening but that it was still advisable to grow whatever one can. Joann Lim stated that, “It wasn’t so much about food security for me, but instead it was about my health and what I love to eat. That’s what made me garden.” Nisha then offered the anecdote of how foreign workers tend to grow all that they eat, and while the variety was nothing to shout about, they have to a certain measure established some kind of food independence. The discussion then focused on working with public authorities and whether gardening in public spaces was feasible or not. Panelists volunteered their experiences on this issue with the general consensus being that it’s much slower to get involved with government bodies and there are often obstacles. Nova advised to work with schools and organisations to get things started. 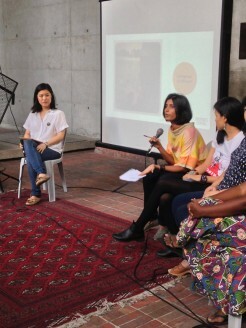 Nisha then advised that it is crucial to find oneself in some sort of reputable body, such as Malaysian Environmental NGO’s as a means to gain leverage to get gardens going in more public spaces. The panel discussion ended with a Q&A session with the audience. 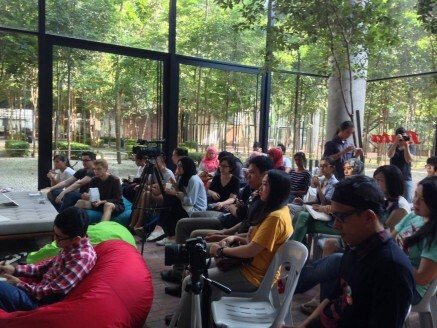 #BetterCities would like to thank the speakers, Tujuan Gemilang and DOOF Industries as well as everyone who showed up that day to make the talk quite a success. We look forward to seeing you again at the next #BetterCities Talks. Jia-Ling spent three years as an itinerant volunteer in South Asia. #BetterCities is a transit point before she resumes graduate studies in Landscape Architecture. Her interests lie in sacred landscapes however one would like to define that.